Morrisonite is found at Morrison Ranch in southeast Oregon on the Owyhee River, and is considered to be one of the finest jaspers in the world. And rarest. And beautiful! 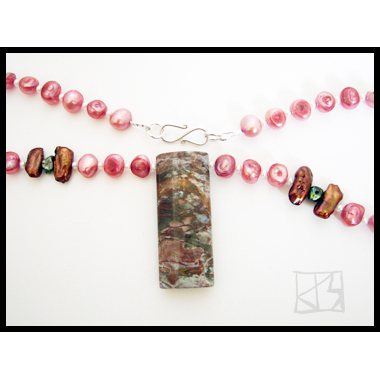 This is a particularly brecciated* example in translucent and opaque hues ranging from off-white to coppery to dusty pinks with a few bands of soft greens. If there is a word for this shape I don't know it -- it's like an ovoid tube, a domed rectangle, and is finished with an expert high polish. I've chosen natural baroque pearls to highlight every color in the stone: mainly mauve-ish pink with accents of bronze and peacock green. 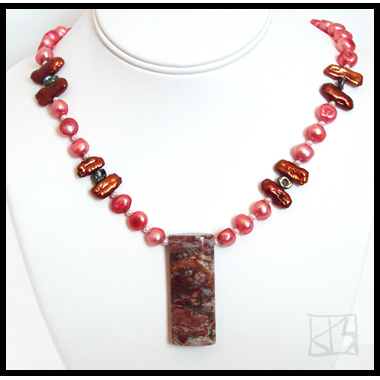 The necklace is secured with a sterling s-clasp. 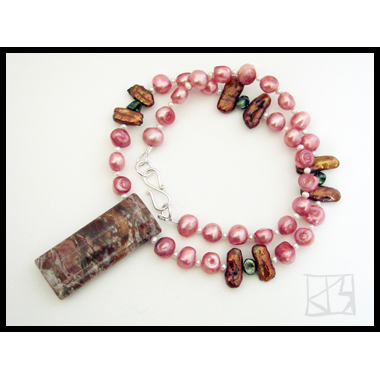 "earth mosaics" is a line of natural jewelry created by debi lee mandel � artist and designer � at her catsprite studios in northern california.